Joan Chittister is an articulate social analyst and influential religious leader of this age. For over 35 years she has dedicated herself to advocating for universal recognition of the critical questions impacting the global community. Courageous, passionate and charged with energy, she is a much-sought after speaker, commentator, counselor and clear voice across all religions. 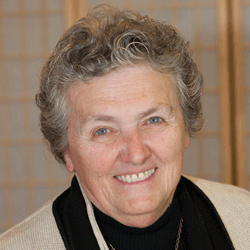 A Benedictine Sister of Erie, PA, Sister Joan is an international lecturer and award-winning author of over 50 books. She has won 16 Catholic Press Association awards for her books, as well as numerous awards for her work for justice, peace, and equality, especially for women, in church and in society. In April 2017 her newest book, Radical Spirit, was published by Random House. A founding member of The Global Peace Initiative of Women, a partner organization of the UN, she works to develop a worldwide network of women peace builders. As co-chair of this group she has facilitated gatherings of spiritual leaders throughout the Middle East, in Asia, Africa, the Far East and Europe in an effort to spread an interfaith commitment to peace building, equality and justice for all peoples. A regular columnist for the National Catholic Reporter, Sister Joan has received numerous awards and recognition for her work including the U.S. Catholic magazine award For Furthering the Cause of Women in the Church and twelve honorary degrees from US colleges and universities. She has served as president of the Leadership Conference of Women Religious, (an organization of the leaders/superiors of Catholic religious women in the US), president of the Conference of American Benedictine Prioresses (1974­90), and was prioress of the Benedictine Sisters of Erie for 12 years. Sister Joan received her Masters degree from the University of Notre Dame and her Doctorate from Penn State University in Speech Communications Theory. In 1996 she was a visiting research fellow at St. Edmund's College, Cambridge University and the Von Huegel lecturer there. She is the founder and executive director of Benetvision: a resource and research center for contemporary spirituality located in Erie.